Dan is an Algonquin from Pikwakanagan (pronounced Pik wak Nagon) First Nation located at Golden Lake, Ontario. Dan walks his path on mother earth in a sacred way. His Spirit Name is Animki Ana Qwat (Thunder Cloud). He was born in the village of Petawawa and was raised there with two brothers and one sister. His grandmother Sarah Jocko and his mother were born and raised in what is today called Springtown, close to Calabogie. Springtown was where a lot of Algonquin people were moved onto the Reserve at Golden Lake, ON. Dan has lived in Ottawa since 1961. 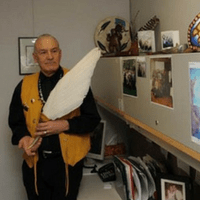 In 2002, Dan was contracted as an Indigenous Cultural/Spiritual Advisor under Elder Services by CSC (Corrections Service Canada) to work with Indigenous offenders. His work in Ottawa consists of helping Indigenous offenders to find services in the area upon release into the community. He also does one-on-one counseling mainly working with their culture loss, life skills and addiction.